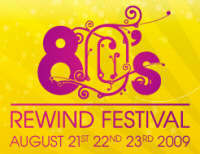 How would you like to win a pair of tickets to the celebration of eighties music that is the 80s Rewind Festival, due to take place in Henley-On-Thames in August? The organisers of the festival have kindly given us two weekend tickets with camping allowance to give away to one of our lucky readers. Â The value of these tickets is a shade under 200 pounds so you could save yourself a considerable wodge of money! For more details on the festival check out our write up or visit the official website. So what do you have to do to win this great prize? Â Simple, just enter your name and e-mail address below and select the correct answer to the following question (hint – the answer is in our write up of the event!). The last entry date for this competition is March 31st 2009, and a winner will be drawn at random from all those with the correct answer.